FlyHigh Cinemas is extremely happy to announce that the premieres of DevaDas are scheduled to be screened across 180+ locations today. The Digital Content Hard drives and KDMs have reached theaters yesterday. Following unprecedented craze, we have added some additional shows in all major locations. 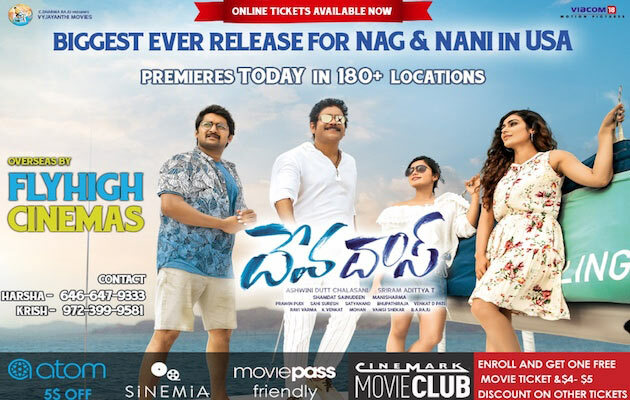 The most awaited multi-starter of 2018 DevaDas stars King Nagarjuna and Natural Star Nani while Rashmika and Akaknskha play the female leads. Actors alongside Deva and Das include Srinivas Avasarala, Vennela Kishore, Sarath Kumar, Murali Sharma and Rao Ramesh. The film promises loads of entertainment as the comedy timing between Das (Nani) an innocent, honest Doctor and Deva (Nagarjuna), an international mafia don is bound to evoke lots of laughter. How Das becomes Deva's friend and how situations change from here forms the rest of the story. The teaser and trailer released have generated positive response from the audience and have clocked more than 8 Million views combined. The movie promises to be an all-out entertainer loaded with comedy and a thrilling storyline. Vyjayanthi movies known for its grandeur is producing this movie while Sriram Aditya (Samanthakamani and Bhale Manchi Roju) directs the movie. The songs composed by Mani Sharma (Vaaru Veeru, Chettu Kinda Doctoru and Lakumika) have already become chart busters. We are sure that antics from Deva And Das will bring the audience to splits. Enjoy the movie in the theaters near you! CLICK HERE!! for the Showtimes.